A great time was had by all – both in making things to sell, and at the actual event, at which we raised £220 towards the Roses Fund. Well done and many thanks to all who contributed. Here are the minutes of the committee meeting held on Wednesday 16 November at 8pm. They include an update on the sale of the Church Hall. Don’t miss the chance to sing these thrilling chants. No need to read music. They are all taught by ear by the inspirational Sarah Pennington. An unforgettable experience that is difficult to put into words. You have to be there! 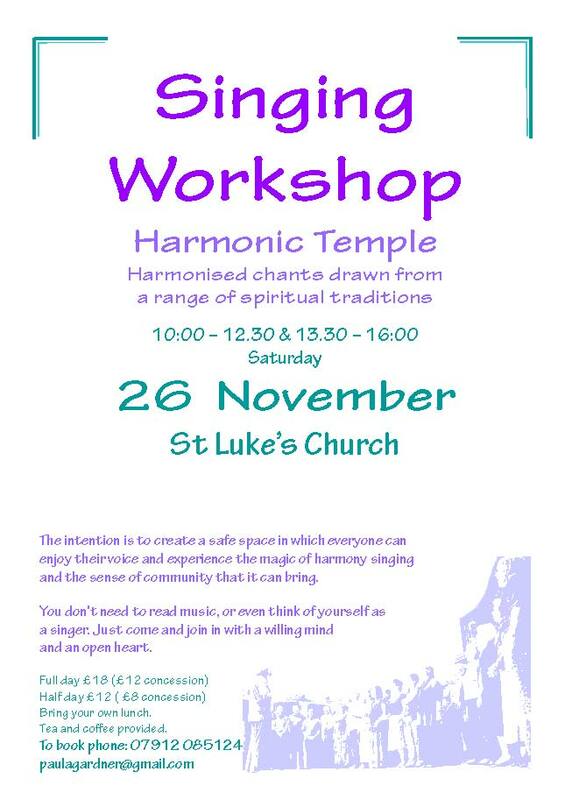 St Luke’s Church, 10.00 – 12.30 and 1.30 – 4.00. Come for the whole day (bring your own lunch), or just a half day.